In Fall 2016, Brandon Cohen excitedly began his role as Brawerman Elementary School’s Head of School. A California native, he - like many of Brawerman’s alumni - attended Harvard-Westlake School, eventually moving on to receive his undergraduate degree from the University of Pennsylvania. After a brief stint as an airline pilot, Brandon’s passion for educational leadership led him to pursue his graduate degree at the University of California – Los Angeles from the Principal Leadership Institute. His dedication and passion for educating children led him to serve as a teacher and school administrator for 13 years, including principal of the highly regarded Los Angeles Unified School District Downtown Magnets High School. His biggest goal as Head of School is to continue the tradition of fostering a supportive community and nurturing environment for students, families and faculty. Nadine Zysman has been an educator for over 16 years. She joined Wilshire Boulevard Temple as a teacher at the Mann Family Early Childhood Center immediately following her graduation from the University of Wisconsin. She received a Master’s degree in School Education and Psychology from Pepperdine University and a Master’s in Business Administration from the Graduate School of Non-profit at American Jewish University. She joined the Brawerman Elementary School family as an administrator in 2013, serving as Director of Admissions and Assistant Principal. Michelle Handzo has been an educator for over 10 years. She began her teaching career with Teach for America in New York while earning her Master’s degree in Early Childhood Education from Bank Street College of Education where she also served as a teaching assistant for courses on curriculum development and emergent literacy. Michelle joined the Brawerman family in 2015 as a Grade 1 Lead Teacher at Brawerman East before moving to Brawerman West as an Assistant Principal of Grades K-2. Currently, she is earning her Doctorate in Educational Leadership from the University of Southern California. Andrea Weinstein has been an educator for over 10 years. After graduating from the University of Southern California, she earned her Master's degree in Education and received her teaching credential from Pepperdine University. Andrea began her career in public schools and came to Brawerman Elementary School in 2011 as a Grade 3 Teacher. Most recently, she earned her Master's Degree in Educational Administration from California State University - Northridge and now serves as the Assistant Principal of Grades 3-6. In the fall of 2017, Lindy Goldberg became Brawerman's Director of Admissions. Lindy hails from Durban, South Africa where she grew up attending a secular Jewish Day School from K-12 and went to college in Cape Town where she majored in Communications and Public Relations. She has resided in Los Angeles for the past 20 years and has worked in Jewish non-profit management for the past nine. Lindy's daughter, Mia, is a graduate of Brawerman. She is excited to work for the place she called home for many years! Rabbi Elissa Schwartz Ben-Naim brings expertise in education to her role as Rabbi for Brawerman Elementary School and head of its Judaic and Hebrew studies program. Following college in 1991, she received a Fulbright fellowship for study in India, where she researched “Women in India: Female Gurus and the Goddess Tradition.” She earned her 1997 master’s degree in Jewish Education at Hebrew Union College—Jewish Institute of Religion in Jerusalem and Los Angeles, and was ordained as a rabbi in 2000. 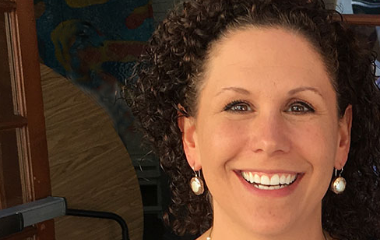 Rebecca is Brawerman Elementary School's Director of Advancement, working with both campuses in their annual and endowment fundraising efforts. She most recently worked at BJE: Builders of Jewish Education assisting day schools in raising endowment funds and leveraging government funds to use for student services and professional development. Rebecca has a dual Master’s degree from Hebrew Union College in Jewish Nonprofit Management and the University of Southern California in Social Work. She spent 15 summers as a camper and counselor at Camp Hess Kramer and Gindling Hilltop Camp, and is excited to be a part of the Wilshire Boulevard Temple family!